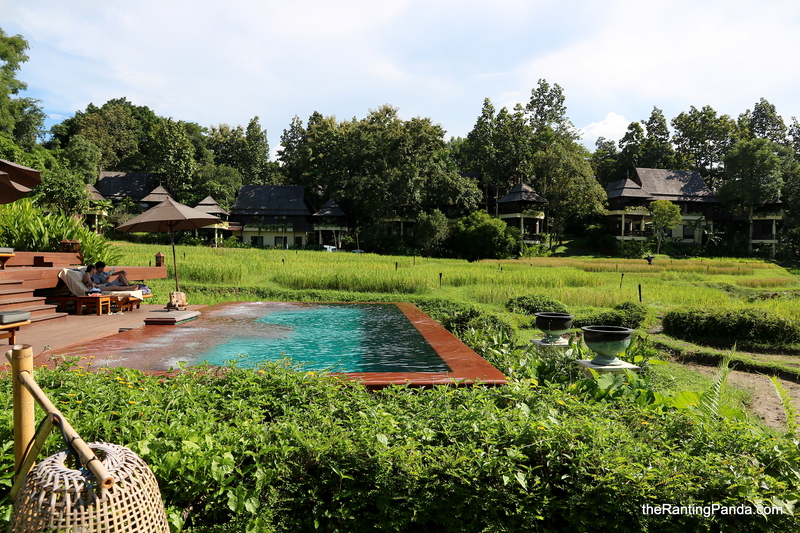 The Place Located at the north of Chiang Mai city, in the Mae Rim village, the Four Seasons Resort Chiang Mai occupies a 30ha land incorporating both luxury and nature into the resort. Well-maintained by a crew of 40 farmers, the resort left nothing to chance in ensuring their guests get the best environment to soak in while here. Despite the size of the resort, there are just slightly more than a 100 keys in the resort, with guest’s privacy and top-notch service a priority here. Most of the rooms are renovated only recently in 2015, with the villas newly included into the resort some years earlier – all well maintained and with such thoughtful design, the only trouble you may have is deciding which corner of the property you should spend time chilling at. The Room Checked into the Upper Rice Terrace Pavilion, giving you sweeping views of the paddy fields and the lake. All rooms here get you an outdoor-sheltered pavilion, equipped with a swing chair. Back inside, the spacious design and the high V-shaped ceiling optimize the space here, with the guests enjoying views of the paddy fields outside from the comfort of their bed. Walk inside the toilet, through the sliding doors, the dual-vanity basins sits on the right and on the left, storage space enough for your entire summer clothing collection. Right in the middle is a meter long leather stool, in case you got tired while standing and brushing your teeth before bedtime. At the ends are three cubicles with the essentials on the left, and the showers on the right. At the middle is the bathtub with a 270 degree glass enclosing it, giving the guest views of more greens while soaking in the tub. The Facilities One thing for sure at Four Seasons Chiang Mai, you may not have a reason to head out to the town. The main swimming pool is located in the middle of the resort, and heads in as deep as 2.6 meters for diving wannabes. Just steps from this pool is the adult-only dip pool located amidst the paddy fields. More than enough sunbeds dotting both pools, you get an onside bar and jacuzzi. Just below the swimming pool is the Fitness Centre, Pilates Studio and the kids’ play area. Guests can head here to rent one of the bicycles and take a ride around the resort or be more adventurous and cycle out to the Mae Rim village. There are recommended routes, and even a few cafes to grab a coffee while enjoying the easy work-out. There are daily activities throughout the day, including rice planting, complimentary for guests. Or perhaps heading to the fields with the two in-house buffalo, and just busk in the sun while they get themselves fed and bathed for the day. Another daily activity to look out for at the lush resort is the Farmers’ Parade in the evening where the industrious group of farmers will take a walk around the resort to signify the end of a day’s of hard work. There are also other facilities around the resort, including tennis courts, a shopping arcade and another swimming pool at the Residences’ end of the resort. The Restaurants Two restaurants at the Four Seasons Chiang Mai seeking to please the palates of its luxury travellers. The European-Italian concept, Terraces, dishes out some Italian classics and western cuisines while diners overlook the paddy fields – the restaurant sits conveniently beside the main swimming pool. We had our dinner here during our stay, and we were impressed despite our initial scepticism of Italian food in Chiang Mai. We were more than glad to be proven wrong. Another restaurant at the resort has to be Thai-cuisine focus, since we are in Thailand. The Rim Tai Kitchen doubles as the all-day dining concept of the hotel where guests have their breakfast, while serving fine Thai cuisine when the sun sets for the day. What’s more exciting is that a brand new Thai restaurant will be opening just below the lobby of the hotel before the year, with Rim Tai Kitchen focusing on delivering cooking classes to the Four Seasons guests. We had the opportunity to join in for the morning class, which includes a trip to the local food market in Chiang Mai city, and almost 3 hours of cooking lessons under the very dedicated guidance of the chef to prepare 4 Thai dishes – which guests will get to savour for their lunch! This is the popular Khao Soi, a Burmese-inspired noodles which is popular in Norther Thailand and parts of Laos. To put simply, the dish is a curry-based egg noodles topped with fried egg noodles; although the ingredients that gets to the curry comes from a myriad of spices with Indian and Burmese influence. The Surroundings You are approximately 30 minutes away from the city, and with the bicycles on hand, you can take a ride out to the Mae Rim village. And if that’s not what you are looking for, the resort provides a handful of complimentary transport into the city, stopping at the Chiang Mai Night Bazaar. From there, you can either head into the old town, or get a ride through either the local taxi or the ever-convenient Uber and Grab, and head over to the hippest part of town now, Nimmanhaemin. Thinking of what to do in Chiang Mai? Here are just some of the highlights of Chiang Mai for us. Rants Luxury stay comes with a price tag. Be ready to spend while at Four Seasons Chiang Mai Resort. Overall Experience This is definitely one of the most luxe stay for the pandas, and we have no doubt that it deserves the many accolades it had won over the years. The resort seems to deliver on all notes, from arrival to the daily experiences across the resort. A worthy special mention is the high level of dedicated service at Four Seasons Resort Chiang Mai, where we could truly feel the warmth, sincere service and smile from every staff. We were left quite lost for words when asked for suggestions on where the hotel can improve further during our check-out, perhaps another night here in this paradise?